by By Keith Scott, A.T.C., C.S.C.S. Believe it or not, you can build rock-solid core strength without standing one-legged on a ball while pressing pink dumbbells. A century or so ago, practically every guy who trained with weights had a strong core, which he got without using new age equipment, doing hundreds of crunches, or joining a Pilates class. It’s time you learned the truth about what the core is and how it should be trained for health, performance, and eye-popping abs. Though commonly used to refer to the abs and lower-back muscles collectively (considered the epicenter of the body), the term “core” actually applies to several muscles throughout the upper and lower body. The transverse abdominis, rectus abdominis (your six-pack muscle), internal obliques, multifidus, spinal erectors, lats, glutes, and traps can be considered core muscles. They all work together, often simultaneously, to stabilize and support the spine. Since the spinal cord is the main avenue for sending messages to the muscles throughout your body, the safer your body senses that it is the more comfortable it feels sending those messages out and the more clearly they’re received. Building a strong core is the first step toward making maximal gains in strength and power, and performing any kind of skilled athletic movement. Strong supporting muscles around the spine also reduce lower-back pain, as well as the risk for lower-back injury. Finally, since the core encompasses all the abdominal muscles that make up that aesthetic six-pack look, it’s the foundation of a ripped midsection (though you may need to clean up your diet to see it). Nevertheless, a well-defined set of abs does not mean a strong core. So how can you tell if your core is in shape? One of the most basic, easy, and effective methods to test core strength is the plank. If you’ve ever taken a yoga class (or listened to your lady talk about one), this move should be familiar. Simply get down on your hands and knees as if you were about to perform a pushup, then bend your elbows 90° so that you’re resting your forearms flat on the floor. Keep your eyes focused on the floor and your hips braced—your body should form one straight line. Hold the position for as long as you can. (As time elapses you’ll feel all the above-mentioned core muscles squeezing.) If you can hold the plank for two minutes or more without breaking form or experiencing pain, your core is reasonably strong. If you can only hold the plank for between one and two minutes, practice it whenever you get a chance and work to improve it over time. Also, limit the loads you use in your training, and concentrate more on bodyweight exercises. Start using more one-legged exercises in your workouts, and concentrate on keeping perfect form throughout. Do not attempt any heavy lifts until your plank time improves drastically. Beware: If your core is weak, you not only severely compromise the amount of strength and muscle you can build in your workouts, but you also risk serious injury lifting heavy weights or doing any exercise that loads the lower back. Take our core training tips seriously, and you’ll ensure safe and steady progress for as long as you train. When trainers test their clients’ core strength, the ones who perform best are almost always the strongest squatters and deadlifters. This is not by accident. Squats and deadlifts—but also shoulder presses, chinups, lunges, and a host of other compound, free-weight exercises (some of which are discussed later)—demand that the core muscles clamp down hard to support the spine under heavy loads. The core keeps your back upright whenever there’s a bar resting on it or being pressed overhead, and it prevents your spine from rotating when you have a load pulling you to one side (as in a dumbbell lunge or one-armed press). So, in essence, just performing these exercises alone provides a great core workout. Though neither a Swiss or Bosu ball is absolutely necessary for a fully developed core, each can be a highly useful tool that you can work in as a supplement to your main lifts. If you have a pre-existing lower-back problem, a Swiss ball might allow you to train your abs without aggravating it. The ball also allows you to move through a greater range of motion than a crunch done on the floor would. Furthermore, you can perform certain upper-body exercises on it, such as chest presses, which will fire up the core and prepare you for stronger benching when you return to the conventional bench press. Certainly the most ridiculous trend in core training, and abuse of its equipment, has been the notion that you should perform all of your exercises on the Bosu ball. The theory behind this is that your core will work harder as your body struggles to balance itself on top of the ball. While this kind of training does make any movement more difficult to perform, it prevents you from using anything approximating a heavy weight, so your muscles go unchallenged. You won’t build any muscle or strength this way, and your core will never be conditioned to handle the stresses of tough workouts or sports. Unless you’re training to improve your performance during an earthquake, exercising on an unstable surface offers no real advantages. Ultimately, doing so will leave you weaker and more at-risk for injury. To truly tax your core, keep your feet on a stable surface, and train with time-proven simple exercises such as those given here. Situps are fine, but these are the core exercises you really ought to be doing. A steady regimen of multi-joint, freeweight exercises like the squat and deadlift should build your core along with the rest of your body, but these supplemental core exercises are what you need to truly pass the plank test. Learn them all, and cycle them in and out of your workouts from now on. Stand with knees slightly bent and hold a weight plate in front of your hips. Keeping your arms straight, slowly raise the plate in front of you until it’s at shoulder level, and then lower it back down. That’s one rep. Perform 2-3 sets of 8-12 reps, resting 60-90 seconds between sets. Make sure you keep perfect posture—shoulders back and chest out—the entire time. 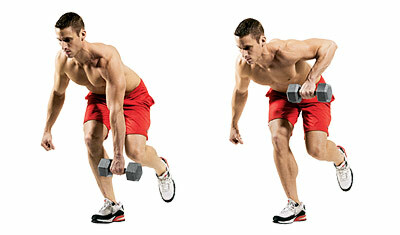 Hold a dumbbell in one hand, and stand on the opposite leg. Keeping your lower back in its natural arch, bend forward at the hips until your torso is about 45° to the floor. Row the weight to the outside of your chest, and lower it back down. That’s one rep. Perform 2-3 sets of 8-12 reps on each side, resting 60-90 seconds between sets. Hold a dumbbell in one hand at your side, and squat as low as you can—as if you were putting down a suitcase. Perform 2-3 sets of 8-12 reps on each side, resting 60-90 seconds between sets. You can do these with either a barbell or dumbbells. Simply hold the weight at arm’s length overhead, and squat or lunge. Perform 2-3 sets of 8-12 reps, resting 60-90 seconds between sets. Raise one leg out in front of you, and squat as low as you can. Perform 2-3 sets of 8-12 reps on each leg, resting 60-90 seconds between sets. Keith Scott is a strength coach and injury-prevention expert.